1 What Is Coffee ? Coffee is a complex chemical mixture comprised of coffee beans. It is one of the most ubiquitiously consumed beverages due to its specific aroma, taste and biochemical and psychoactive properties. Coffee is consisted of nonvolatile substances such as caffeine, trigolein, chlorogenic acid, phenolics, amino acids, carbohydrates and mineral. Volatile substances are organic acids, aldehydes, ketones, esters and amines. There are three types of polysaccharides contained in coffee beans: cellulose, arabinogalactan type II (AGII) and galactomannan. The main coffee compound is caffeine (trimethylxanthine) which represents and adenosine receptor antagonist. It is present as well in tea and energy drinks. The important fact is that caffeine does not deposit in the body tissues, but is eliminated through the urinary system after 3-4 hours upon its intake. In the vast majority of epidemiological studies it has concluded that coffee consumption could prevent certain chronic diseases such as diabetes mellitus type II, artherosclerosis and neurodegenerative disorders and liver cirrhosis. On the negative side, it may be the causative agent of high cholesterol levels, high blood pressure and certain neurological impairments, if consumed in larger amount. It is known that caffeine may pass through all types of membrane due to its hydrophobic attributes. 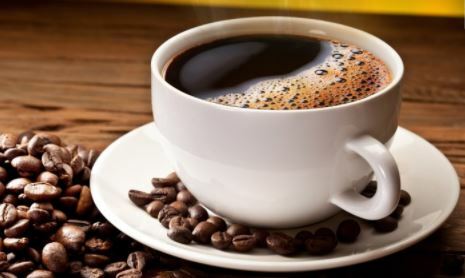 According to the recent studies, it has been concluded that moderate coffee consumption ( 3-5 cups of coffee per day providing 300-400 mg/ day of caffeine) may strengthen and improve the quality of human DNA. Phenol compounds in coffee such as chlorogenic, caffeic and ferulic acid are the most potent antioxidant substances. (5)Their effect is to neutralize reactive oxygen species that damage proteins and DNA. Caffeine is a moderate analgesic. It is known that a major cause of headache is the dilatation of blood vessels. Caffeine may lead to the opposite effect – vasoconstriction, therefore minimizing the pain. If consumed together with the pain medications, it may enhance their absorption in the organism. Coffee beans are rich in dietary fibers – cellulose, type II arabinogalactan and galactomannan that are not digestible. This type of nondigestible polysaccharides are not metabolized or changed in the digestive system, therefore are a major component of dietary fibers. A number of studies has shown that coffee may decrease the risk of liver diseases such as cirrhosis in 44% of cases due to its antioxidant and antiinflammatory effects. Recent studies have shown that moderate coffee consumption may decrease the risk for the hepatocellular carcinoma. High caffeine serum levels may reduce the inflammation in the brain tissue in the adult over the age of 65.In Alzheimer’s disease, there is an accumulation of ß-amyloid andtau protein. Being an adenosine receptor antagonist, caffeine inhibit certain receptors in brain tissue that are responsible for tau depositions. Aside from the brain stimulation, there is certain evidence that 2 to 4 cups per day of coffee may decrease the symptoms of depression and suicide risk. High consumption of coffee is associated with decreased multiple sclerosis risk. (12)Caffeine acts neuroprotectively, thus suppressing the production of proinflammatory cytokines that are key substances in the pathogenesis of multiple sclerosis and its clinical course. Endogenous opioids regulate certain emotions such as pleasure, mood and drive control areas in the brain, and act as drugs. Opioid antagonists may prevent the relapse in alcoholism as well as in other addictions. The moderate coffee consumption is in positive correlation with the duration of sobriety. Adenosine is responsible for the basic sleep process and it slows down the activity of neurons.Caffeine is a potent adenosine antagonist and its function is to stabilize membrane cell activity. It as well prevents cellular damage in various tissue insults such as oxidative stress, excitotoxicity. Caffeine binds to adenosine receptors in the brain, therefore inhibiting the physiological response and causes enhanced alertness. (13)Caffeine inhibits release of several neurotransmitters. Coffee is known to be mild diuretic. It may prevent the onset of diabetes type II due to antioxidants that prevent the tissue injury via oxidative radicals. Coffee contains magnesium and chromium that regulate the insulin metabolism, therefore contributing to the glucose regulation. Caffeine helps the body burn fat instead of carbohydrates. The antioxidant capacity in coffee could be responsible for the beneficial effect in the arterial blood vessels, thus lowering the incidence of plaque formation. Dihydrocaffeic acid has protective and reparative role in endothelial dysfunction. It has been noted that individuals that consume 2-3 cups of regular coffee per day have a 20% decreased risk for gallstones. The mechanism may be due to the fact that caffeine stimulates the gallbladder to contract and to eliminate cholesterol and bile type stones. Caffeine is a mild psychomotor stimulant. Its effects in the brain are achieved via blockage of A1 and A2 adenosine receptors. At the same time, caffeine induces alertness, uplifts mood and increases the sense of well-being as well as motivation and socialization. Pregnant women should be advised to consult their healthcare provider about caffeine use. Reducing caffeine intake during early pregnancy may be advisable. If consumed in pregnancy in the greater amount it could lead to a low birth weight. Regular coffee consumption might be associated with the lower incidence of several types of cancer due to its powerful antioxidative effects. The main mechanism in skin tissue is increased apoptosis rate in cells that are damaged by ultraviolet rays. Higdon JV1, Frei B.Coffee and health: a review of recent human research.Crit Rev Food Sci Nutr. 2006;46(2):101-23. Cornelis MC1, El-Sohemy A, Kabagambe EK, Campos H.Coffee, CYP1A2 genotype, and risk of myocardial infarction.JAMA. 2006 Mar 8;295(10):1135-41. Bakuradze T1, Lang R, Hofmann T, Eisenbrand G, Schipp D, Galan J, Richling E.Consumption of a dark roast coffee decreases the level of spontaneous DNA strand breaks: a randomized controlled trial. Eur J Nutr. 2015 Feb;54(1):149-56. Eskelinen MH1, Kivipelto M.Caffeine as a protective factor in dementia and Alzheimer’s disease.J Alzheimers Dis. 2010;20 Suppl 1:S167-74. doi: 10.3233/JAD-2010-1404. G. Webster Ross, MD; Robert D. Abbott, PhD; Helen Petrovitch, MD; et al. Association of Coffee and Caffeine Intake With the Risk of Parkinson Disease. JAMA. 2000;283(20):2674-2679. Marc-Antoine Crocq,Alcohol, nicotine, caffeine, and mental disorders. Dialogues Clin Neurosci. 2003 Jun; 5(2): 175–185. Pereira MA, Parker ED, Folsom AR.Coffee consumption and risk of type 2 diabetes mellitus: an 11-year prospective study of 28 812 postmenopausal women.Arch Intern Med. 2006 Jun 26;166(12):1311-6. Lee K1, Lee BJ2, Bu Y3.Protective Effects of Dihydrocaffeic Acid, a Coffee Component Metabolite, on a Focal Cerebral Ischemia Rat Model.Molecules. 2015 Jun 30;20(7):11930-40. Schmit SL, Rennert HS, Rennert G, Gruber SB.Coffee Consumption and the Risk of Colorectal Cancer.Cancer Epidemiol Biomarkers Prev. 2016 Apr;25(4):634-9. Higdon JV, Frei B.Coffee and health: a review of recent human research.Crit Rev Food Sci Nutr. 2006;46(2):101-23. Quinlan P, Lane J, Aspinall L.Effects of hot tea, coffee and water ingestion on physiological responses and mood: the role of caffeine, water and beverage type.Psychopharmacology (Berl). 1997 Nov;134(2):164-73. Lesk VE, Womble SP. (2004).Caffeine, priming, and tip of the tongue: evidence for plasticity in the phonological system. Behavioral Neuroscience. 118 (2): 453–61. Han ME, Park KH, Baek SY, et al (May 2007). Inhibitory effects of caffeine on hippocampal neurogenesis and function Biochem. Biophys. Res. Commun. 356 (4): 976–80. Kamijo, Y; Soma K, Asari Y, Ohwada T (December 1999).Severe rhabdomyolysis following massive ingestion of oolong tea: caffeine intoxication with coexisting hyponatremia. Veterinary and Human Toxicology 41 (6): 381–3.